Advocating for respect, dignity, and LGBTQ rights in the workplace – and throughout society – is a core value of UFCW Canada. As Canada’s leading and most progressive union, we believe that building fairness and strength for UFCW Canada members and all workers means celebrating the tremendous diversity of our workplaces and communities. Since signing a historic partnership with the EGALE Canada Human Rights Trust, our union has greatly expanded its work with and outreach to the Lesbian, Gay, Bisexual, Transgender, and Queer (LGBTQ) community by introducing project-based initiatives such as the LGBTQ: Being Inclusive webCampus course for UFCW Canada members. In partnership with our friends and allies in UFCW OUTreach, a constituency group dedicated to building mutual support between UFCW members and staff and the LGBTQ communities in Canada and the United States, our union advocates for full equality for LGBTQ workers on their jobs and within their unions. 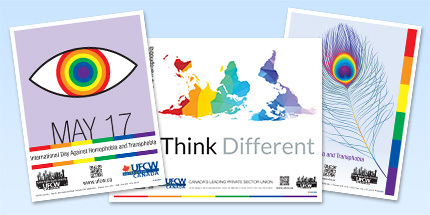 UFCW Canada is also a member organization of the International Lesbian and Gay Association (ILGA) and has established itself as a leader in advocating for rights-based legislation such as Bill C-279, a proposed law dedicated to promoting greater equality in the area of gender identity and expression in Canada. This year our union obtained membership in the Canadian Professional Association for Transgender Health, and we are now working diligently to build workplace cultures that support and accept all UFCW Canada members regardless of their sexual identity and orientation. With Pride Season upon us, and in an effort to lead the Canadian labour movement in advocacy for LGBTQ rights both in the workplace and in Canadian society, UFCW Canada's National Office and Local Unions will be participating in Pride festivals across the country this summer. Please click here for details on the various Pride festivals taking place across Canada over the next few months.